Every observership program is different and has different requirements and you can also apply directly to individual physicians or departments in the hope of getting a placement. However, you do it you need to ensure that the first thing that the person reads will make an impact in your favor. This will often be your cover letter for observership. This needs to be written in a way that leaves no doubt in the mind of the reader as to your need to take part in an observership with them. Always visit a program’s website to review specific program requirements and learn what makes a program unique. 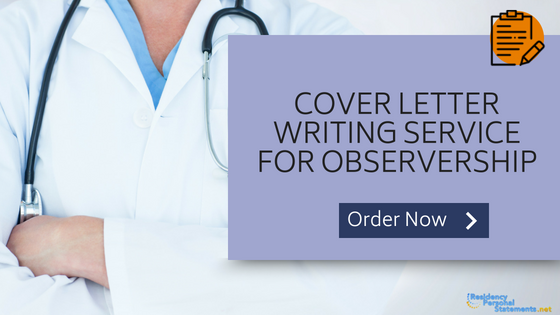 How Should You Write a Cover Letter for Observership in Hospital? Briefly state where your interests lay and why so that it is clear you have a real interest in their area. Show that there is a specific reason and need to conduct your observership and what you specifically hope to learn from it. Give specific reasons for coming to them for your observership. Explain the skills and other qualities that you have that will make you an excellent resident and specialist in the future. Describe your future goals for your career in your chosen specialty and where you see yourself in the next 5 to 10 years. Always write from a positive viewpoint, what you will do, not what you want to avoid. Use concise and easy to understand language, don’t try to show off. Never state anything that is obvious; they know you are writing the letter and that you are applying to them etc. Don’t use any clichés in your writing. Never use humor nor exaggerate your abilities or anything else. Demonstrate your skills and achievements with clear and easy to follow examples rather than claims that are unsubstantiated. Remain truthful from start to finish without any embellishment or exaggeration: you could be asked many questions of what is in your statement. Never use your statement as an opportunity to make excuses or to complain. Ensure that everything that you include is totally relevant to your application: if it is not then it should not be in your statement. If you are wondering how you are going to write the very best cover letter for observership you need worry no longer. The answer you need is right here through our professional yet highly affordable highly specialized services. We specialize in medical residency applications and are also highly experienced in observership applications to all different specialties and hospitals. Our experts hold higher degrees and also have a huge amount of experience in writing successful letters. Highly qualified staff that will work directly with you to ensure that your statement is carefully tailored to reflect just what you have to offer the program. Unique well-written letters that are written from scratch not to a generic template. Your letter will be supplied to you with a plagiarism report to confirm it is original. Fully confidential services: no one will know that you have used our help and we will share nothing about you with other parties. Very affordable support: our pricing is some of the lowest that you will find online for this level of help. Delivered on time: we work quickly with you to ensure that your statement will be ready for submission when you need it. Full money back guarantee: if we cannot fully satisfy you or fix any issue that you have then we will refund your money. Get selected by using our highly effective writing and editing services to make your cover letter for observership stand out from the crowd.